We ended our may term by eating at a couple restaurants that were more of a casual fine dining. The first place we went was Bev’s on the River. It is located next to the Hilton Garden Inn on the river just a couple minutes from the Tyson Events Center, so it would be the perfect place to go eat dinner before a show at the Tyson. I have seen commercials for this restaurant and have been intrigued to go, but thought that it would be a little out of my price range to eat there. The atmosphere was great as we walked in. We were once again the first ones there, which seemed to be the common theme for this course. It was nice being early at this restaurant because it gave me a chance to walk around and check out the view of the river that it had to offer. The entire south wall of the restaurant was glass, so the building was both well-lit but had great scenery as well. We were seated at a big table to seat us all together and our water was brought out in nice blue wine glasses. After our group had all arrived, our waitress came out to take our appetizer order. Looking at even the appetizer menu it was clear to me that this restaurant was indeed out of my price range, but the lunch entrees weren’t too expensive. Our table kind of went nuts on ordering the appetizers as we ordered all but one item on the list. Near me was the steak strips and the onion rings. Both of those appetizers were delicious and the sauces for them were great, so I would definitely recommend getting an appetizer when visiting this restaurant. 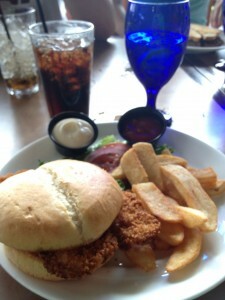 There were a lot of great choices on the lunch menu, but the pork tenderloin sandwich sounded pretty good to me. It came with a side, so I chose the steak fries to go along with it. We were all too busy conversing and eating our many appetizers to notice how long it took for our food to come out, but I don’t think it took that long at all. My food was presented to me well and looked awesome. The pork tenderloin couldn’t be contained by the bun, and the bun wasn’t even a small one. I scarfed down the steak fries right away and they tasted great with the ketchup. Because of the appetizers and how delicious the dessert looked on the menu, I didn’t eat very much of my sandwich, but instead decided to save most of it for later. From what I did eat, I can say that the pork tenderloin is a great choice on the lunch menu at Bev’s. 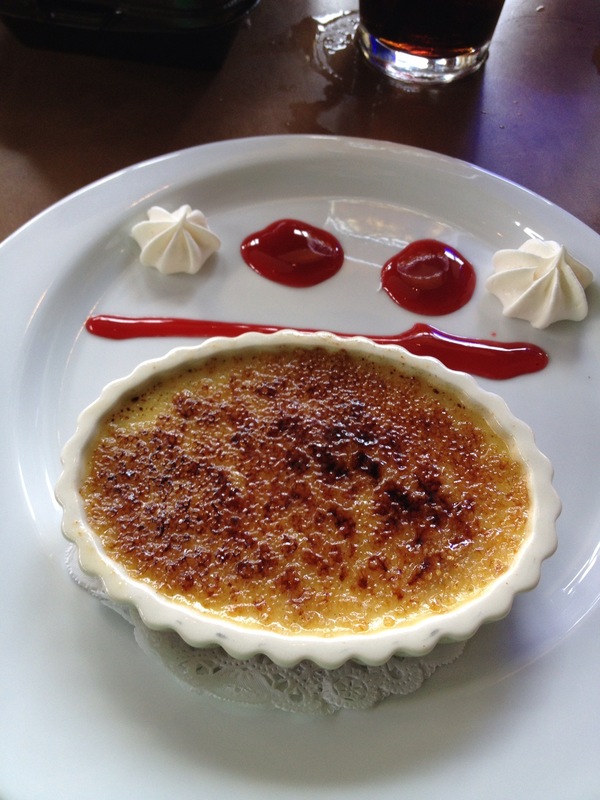 The reason for this decision was because the creme brûlée sounded amazing, so that it was I ordered for dessert. Not only, was the presentation great, but it tasted as good at is looked. It was nice and crispy on top, but underneath that layer was a creamy inside that did taste amazing. I was pleased with our meal at Bev’s on the River. The atmosphere was great with the view of the river and the restaurant itself was very nice. The waitress was kind and helpful with filling our drinks and getting what we asked. The food was delicious and to no surprise I left this restaurant both full and satisfied. Well done Bev’s.